Today I met with Kevin Stiller! 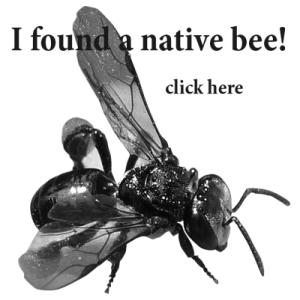 Kevin is a man who I can tell has a lot of native bee knowledge. He has kept honey bees for 48 years and only recently given it away. His interest with native bees however remains strong and it shows. Kevin is retired and has taken up native beekeeping as a hobby. Kevin uses a unique box design that I was eager to meet up with him and see for myself. 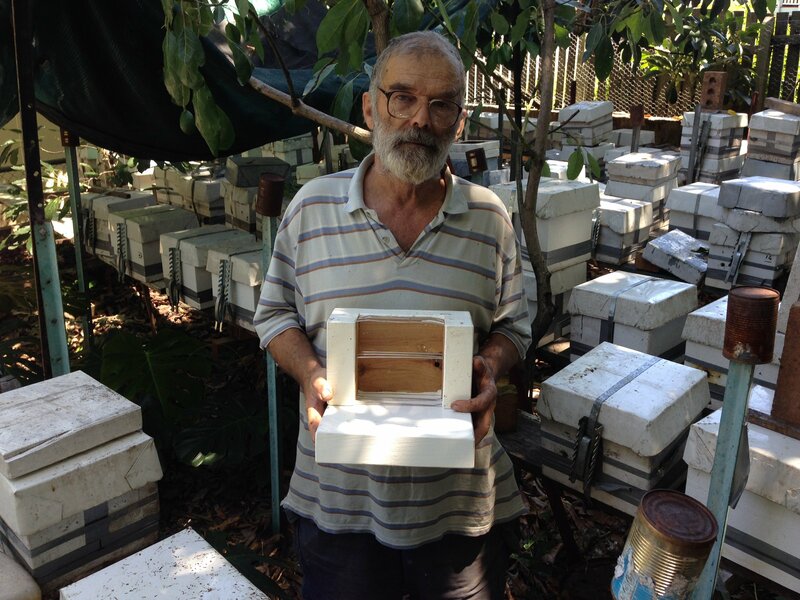 Kevin keeps Hockingsi, Carbonaria and Australis native bees. Kevin is the first person I have met up with apart from Dean and I who keeps his bee hives within close proximity to each other. 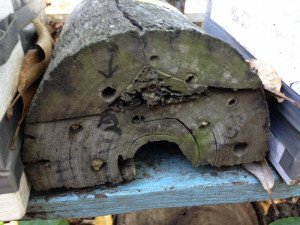 It is a reminder that when space is an issue that native bees are suitable for the urban bee hobbyist. 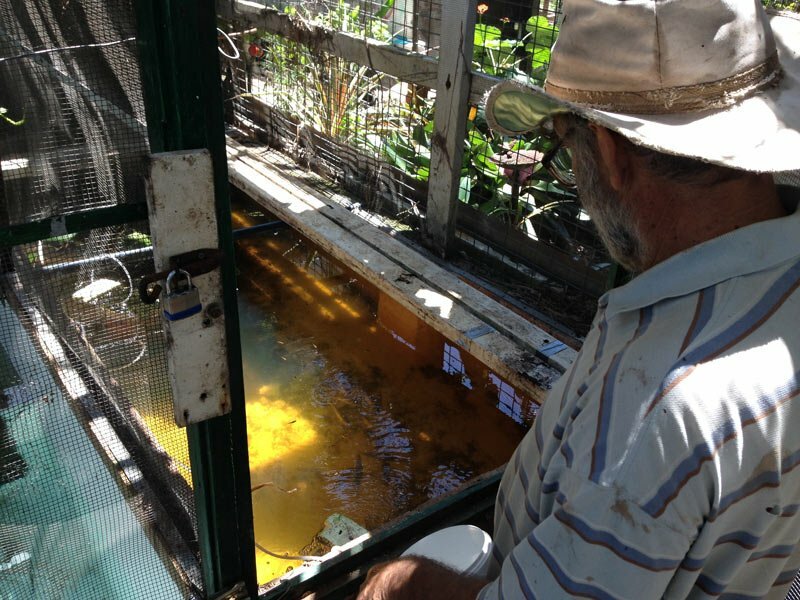 It was nice to see he also keeps fish and the day was so hot I just wanted to jump into the freshly filled tanks he has in his yard. He had a few tanks and what amazed me was the single skin of brick wall holding the weight of the water. Kevin explained it was built properly and so it remains. Kevin’s boxes are a nice design and have worked very well for him to propagate his bees.They are made from cypress pine for its white ant resistant properties with stainless steel anti-slump bars at top middle and base. 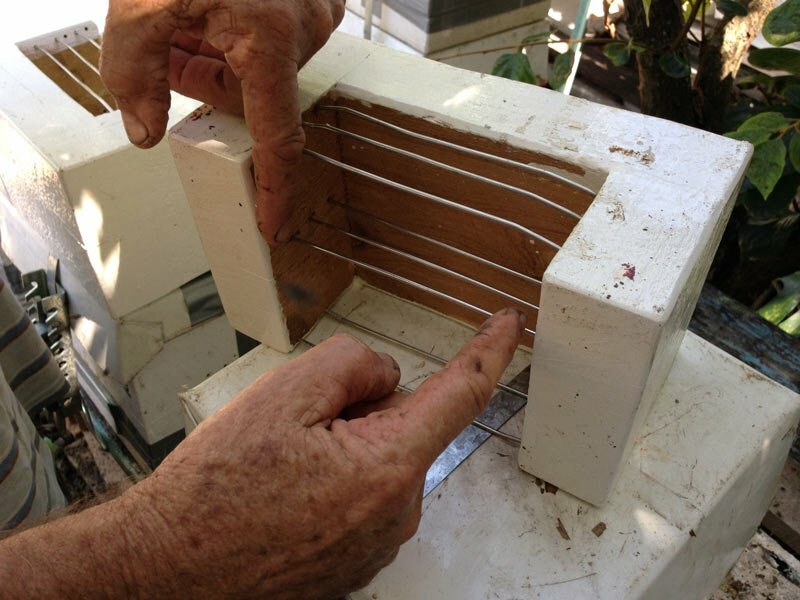 The top of the hive takes advantage of an easy to remove piece of vinyl for fast observation, a piece of Styrofoam and timber to deflect heat complemented with a tin roof. The main advantage of a vertical split is that each half, when split receives the full age spectrum of brood. The half that does not have the queen has a very good chance of survival because a continual flow of bees hatching does not change. Queen cells do not need to be found and therefore less damage is done. A vertical split also takes half the honey and pollen stores with it that are mostly unbroken making it very easy for the bees to clean up the mess. 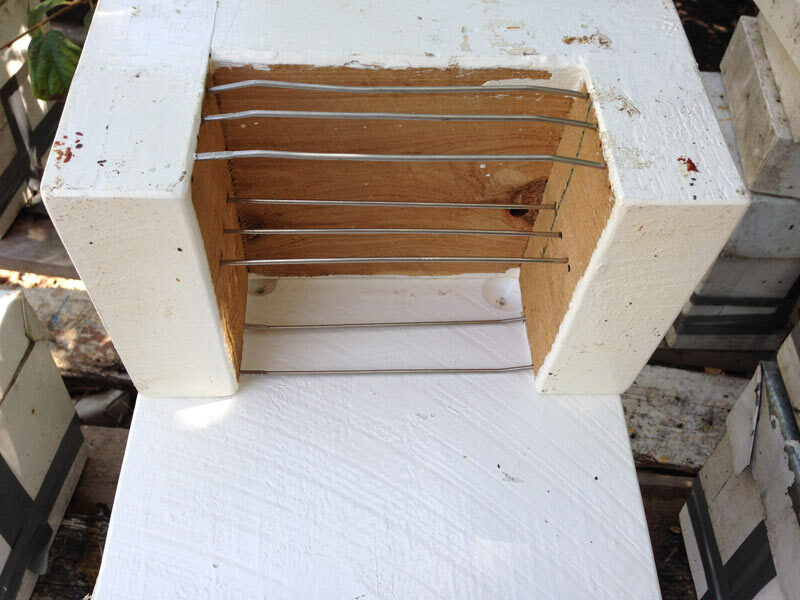 A recent addition to Kevin’s hives is that of a center line of anti-slump bars. Here he explained to me that it is not necessarily the brood that causes the slump but the weight of the honey on top of the brood structure. 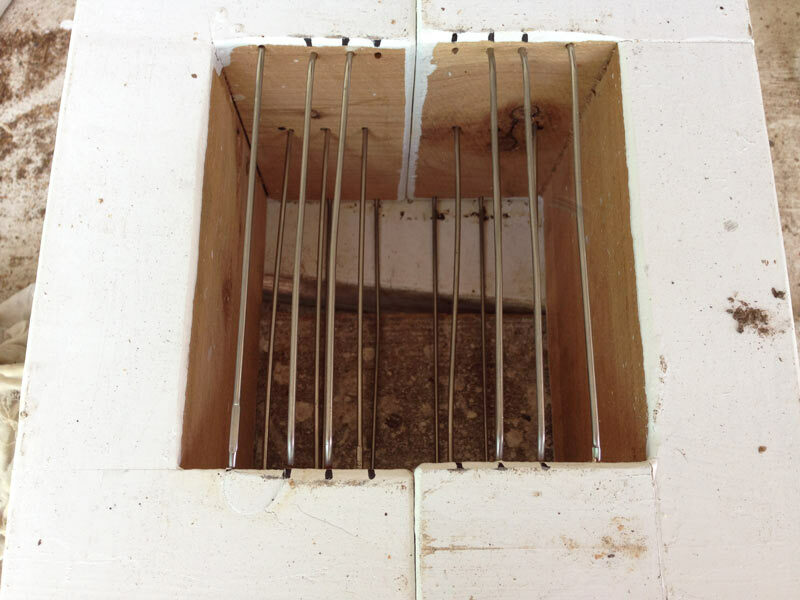 He also showed me the countersunk holes he has placed around his honey drain holes at the base. 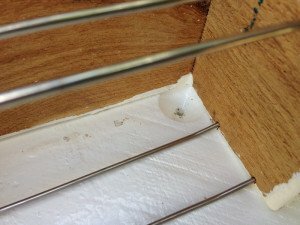 This allows any excess honey to easily find its way out of the hive following a split. 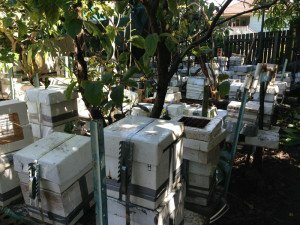 I took some photos of Kevin’s hives that had bees inside them too. Here are Tetragonula Hockingsi. This shows how effective his hives are and how well they work. On the left we see the full hive and on the right a recently split hive. You can see they have repaired everything very fast and placed a sheet of wax down the face of the brood until they are ready to start preparing cells from the base upwards. Kevin Stiller uses this same splitting method on Tetragonula carbonaria and Austroplebia australis as well. I also saw some native bee hotels while I was visiting as well. Before leaving I had some questions for Kevin. 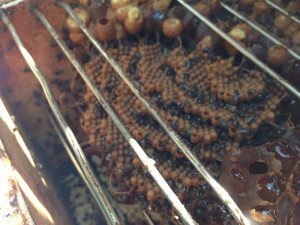 How did you become interested in Stingless bees? 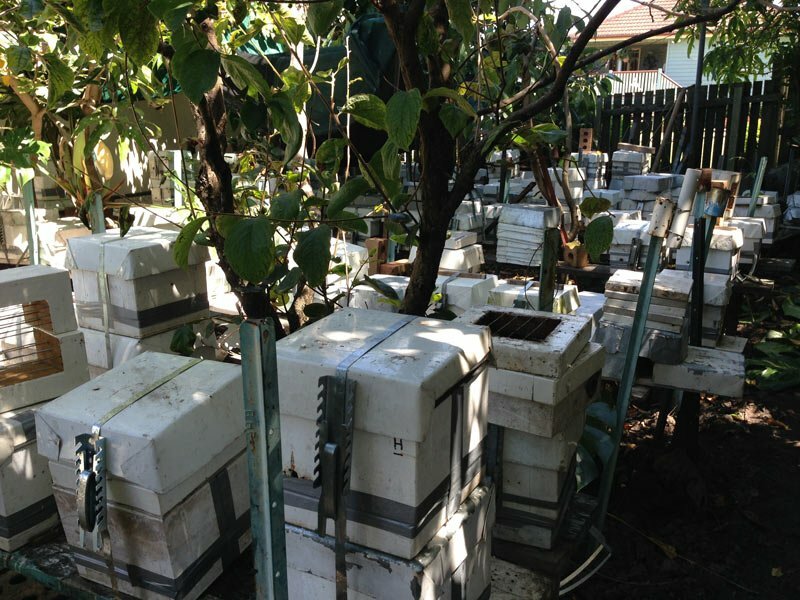 I have always been interested in Honey bees and when the Small Hive Beetle caused considerable damage amongst the honey bees I bought some native bee hives. I no longer have honey bees. Can you think of a memory or story that stands out with your bee keeping? Yes, In the old days, cutting honey bees out of trees. What type of Stingless bee is your favorite and why? Hockingsi, because they are more robust than Carbonaria or Australis. What things do you like about your box design and what inspirations did you have? The vertical split allows for cutting the hive one day and separating the two new hives the following day. This gives any virgin queen the chance to locate to the other half to which the laying queen is on. If there is significant honey spillage during splitting there is only one wet floor. 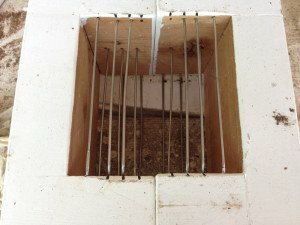 This box allows for a more even separation of brood and a more regular hatching of new bees after splitting. 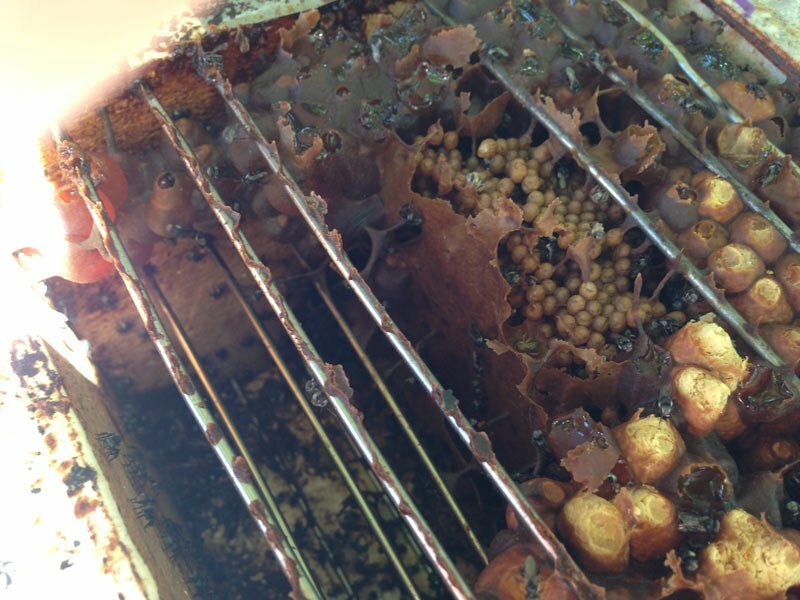 The top and bottom not being fixed allows an easy inspection of any hive with the minimum of disturbance to the hive. The stainless steel wiring is very effective in reducing hive collapse. Why do you believe bees are important? Bees are an important link in natures long chain. Finally what is your one piece of life advice you would share with the world? It doesn’t matter how effective the mouse trap that you are using is, it can always be improved on. Check out Kevin splitting his hive in this video. Nice work Kevin, I like your design of the split and the informative video. This is an interesting article. I’ve read it a few times now. I saw some of your videos on youtube a while ago so I am already familiar with the box. I think it’s interesting that you use the vertical split for carbonaria where these girls have horizontal disks. Do they split ok? This surprised me. I’d also like to give you a pat on the back for championing hockingsi. Too many people seem to turn their nose up at this exceptionally vigorous bee. Do you have a hive design that allows you to get honey from the hockingsi? 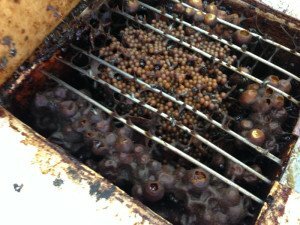 Do you agree that the hockingsi honey is different to the carbonaria?